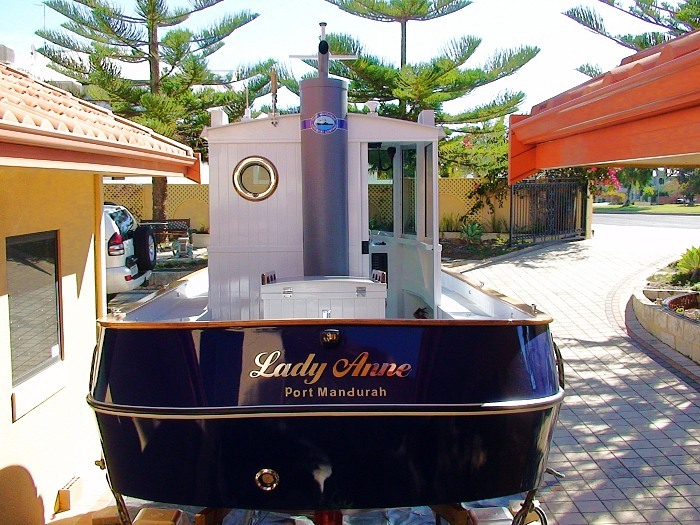 While this is our smallest Mini-Tug, it has one big feature fit for a queen! That is, the double berth in the cabin is actually 5' wide, the same width as a queen-size bed ashore. A hinged panel at the forward end drops down to form an overall berth length of 6' 2". And since you'll sleep with your head toward the bow there's generous headroom above the berth where it's needed. There's space below the helm area/foredeck for a portable head, along with lots of storage here as well as below the berth, which shares space with the engine. Cabin access doors are on both sides and aft, as well as lots of windows for light and ventilation. 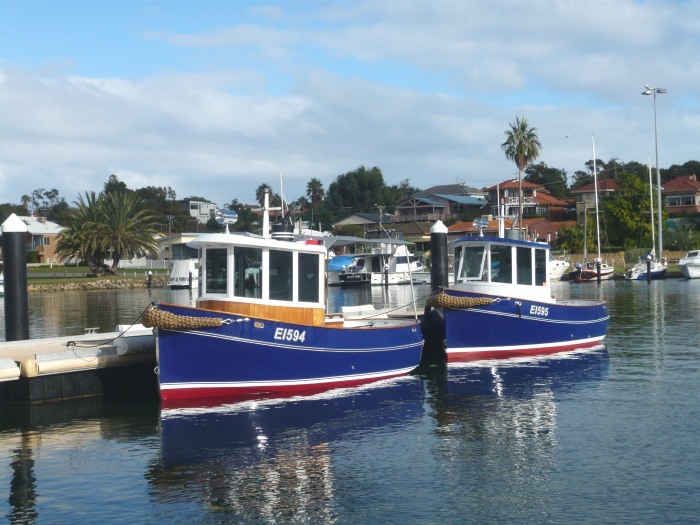 All this makes a boat that's practical for overnighting by a couple, and a great day boat for seeing the sights at a leisurely pace. 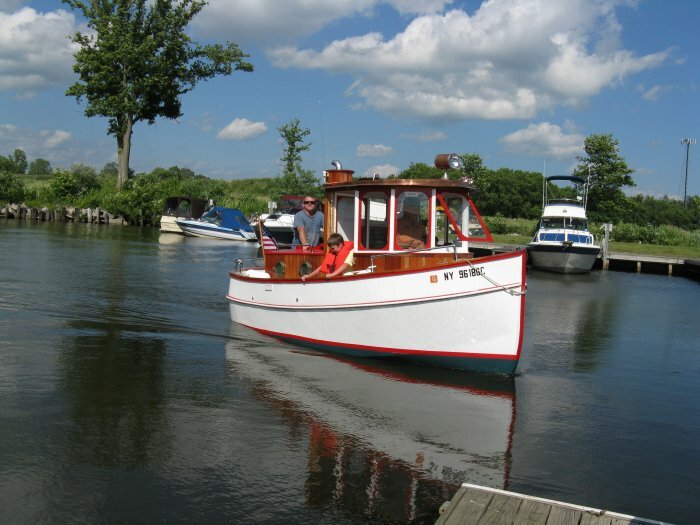 Built by Don Aguanno in wood - Power is a 12HP 2 cylinder Westerbeke with 2:1 reduction gear. 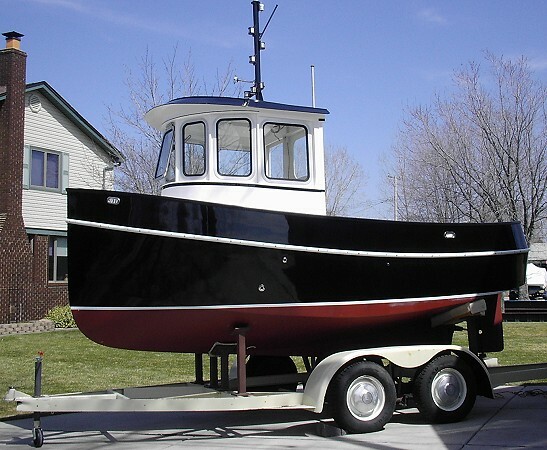 Says Don, "This is the 3rd boat that I have built and I must say it's been the most enjoyable and a great learning experience." 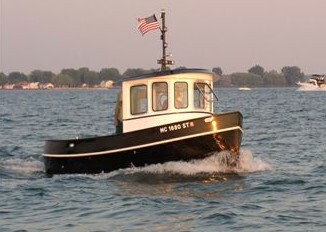 Don hopes to build yet another tug which he plans to do in steel. Built by Brian Bawcombe and Jeremy Whitfield of Australia in wood--they built two! They altered the design by removing the Rear Cabin and incorporating a small Engine Box/Storage Locker. The two Side Doors to the Pilot House were deleted and a rear facing Sliding Cabin Door incorporated. Trailer: Designed for use with Glen-L Series 2900-3800 boat trailer plans. FULL SIZE PATTERNS for frames and stem contours, instructions, and material lists come with all plans.